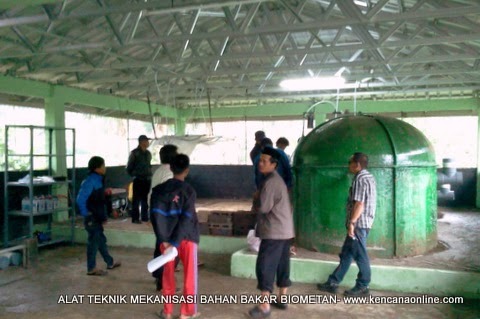 In the first 36 tons of garbage and manure biogas digester is loaded, but in the next day continuous charging 1.8 tons / day . 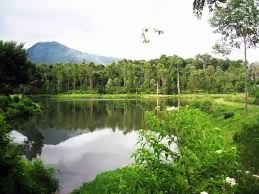 That new activity Teams Community Group ( TKM ) which seeks a majority of dairy farmers and vegetable growers in the district Kertasari, upstream area of Citarum river, or rather at the foot of Wayang mountains, sought to reduce garbage in Citarum river upstream . 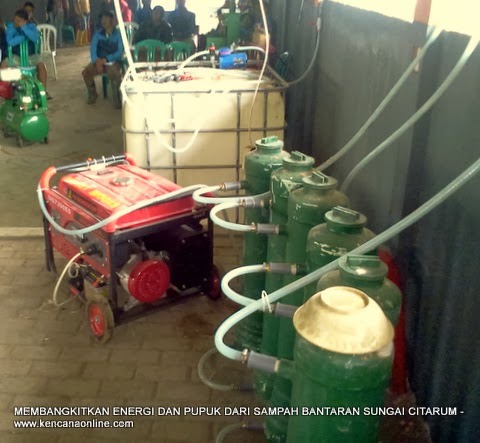 Under the guidance of Tim ICWMRIP, installation and waste if this farm is now producing biogas which, once purified, into renewable natural gas (renewable natural gas ) or biometan RNG . 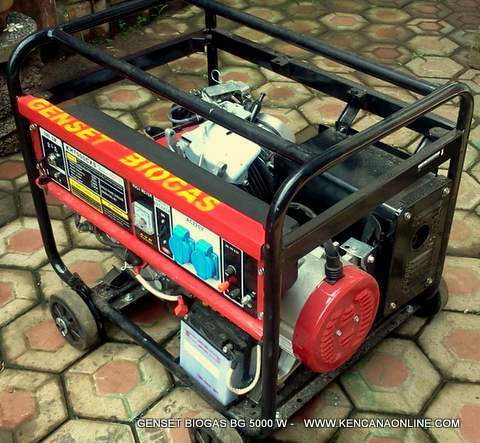 As an environmentally friendly and renewable energy, is used to turn electrical biometan through 2 x 5 KVA generator, able to provide electric power for equipment cleaning machine plastic waste ( MPLP ), woodworking equipment (air compressor -based tools ), as well as lighting. Special lighting, through the inverter 2 KW and 8 batteries ( 50 amps , 12 V ), the power savings banks magnitude 4.8 KWH of power, just as a back up turn the lights 200 watts for 24 hours . 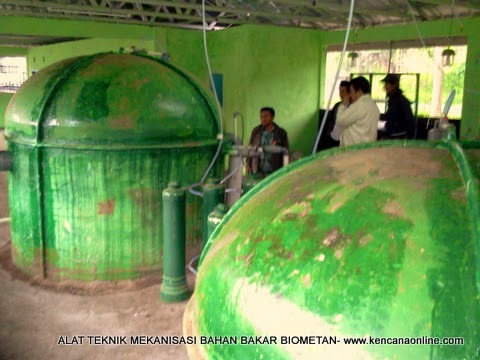 Of 4 @ 9 m3 digester, not only produced at least 40 m3 biometan, but also the mud is organic fertilizer, which is easy to apply for Fertilizers and Fertilization vegetable farming and food sprawling in the cool foothills of the Wayang mountain. 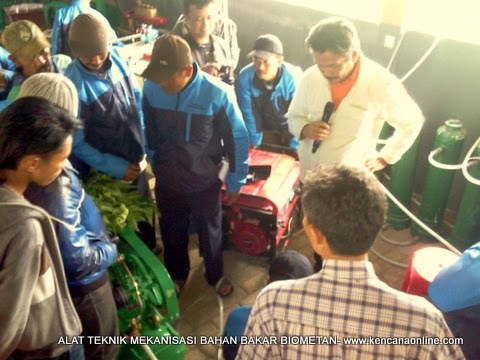 Known from 1.8 tons of material daily input for the fermentation process will produce 40 % of compost ~ 720 kg and 720 liters of liquid fertilizer . The results of the above daily fertilizer certainly encouraging people Kertasari district that the majority of farmers and the dairy farmers . On the one hand farmers received fertilizer near the site without having to rely on suppliers of fertilizer ( chemical ) from the city , and at the same, even dairy farmers can process their waste. Daily results , in addition to fertilizer , in the form of 40 m3 biometan , of course, helps people have a fuel for the generator , the engine ( engine ) and thermal energy ( stove ) - are known to have equal calories with 19.2 kg of LPG or , when used for electricity generation will produce 40 KWH .